Who could vs who will win The 2019 Masters? Update 5. Original post follows updates. Update 3. Original post follows updates. History made on Saturday’s round 3 of the 2019 Masters. Several rounds of 64 vs very few rounds of 64 since the inception! Plus lot of rounds under 70. A perfect storm of warm air, low wind, and wet greens that allowed the players to go for the flag and land the ball pin high for birdies galore. Usually this is not possible at Augusta National Golf Club due to the undulating greens. Even the fairways are hard to hold on lot of holes. 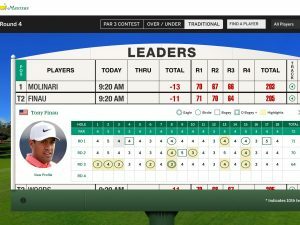 Tony Finau took great advantage and of these perfect conditions. Rightfully so. 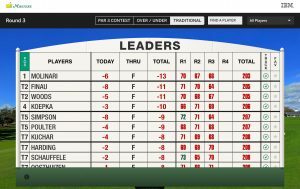 So we now a have leader board and final pairing with Tiger Woods, Tony Finau and the leader Francesco Molinari. 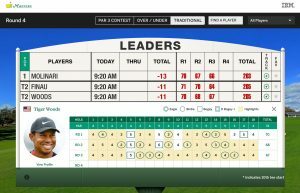 Who could or will win the 2019 Masters today? Sunday, April 14th, 2019. Well, technically it is a bunched leader board. Anyone within few strokes could win the green jacket. However, it will be very hard to score birdies today (Sunday) due to weather. It is more about avoiding bogeys. 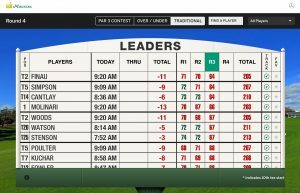 Who has the fewest bogeys amongst the leader board? Francesco Molinari. Just one bogey in 3 rounds!! While Tony Finau had a phenomenal round 3, he does have few more bogeys in previous rounds. 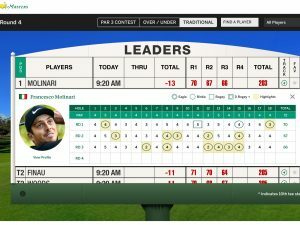 So with the wind, possible rain and Francesco Molinari’s phenomanl precision with that final approach shot and short game, he is likely to have the fewest bogeys and possibly shoot a par round today to win the tournament. Usually it isn’t about few brilliant shots and a great round to be a consistent player. It is more about reducing the blowouts and ability to get par even after a bad shot. Watch for interesting strategies with low punch shots into the wind today. Europeans know how to play in these conditions. Flight Control Systems and Systems Integration issues on Boeing 737 Max 8? The offset was 60 degrees between the two AOA sensors in the case of Ethiopian Air after an incident during take off? Bird strike? MTBF is 93000 hours for the AOA. However, this is a early life failure in case of Lion Air which (the bad AOA ) apparently never worked? Replacement too? How does the input switch between pilot side and other side between flights? Physical wiring change by maintenance crew? How will the flight control system known faulty sensors? With 2 sensors, if they disagree, the fix simply doesn’t activate MCAS is difference ismore than 5 degrees as per reports. 94 % trust during take off is standar but the aircraft was over max safe speed of 250 knots? 300 knots and then 500 knots eventually. Air traffic control also noticed the high speed. Could there be other things going on that we don’t know yet? The erroneous AOA sensor in the case of Lion Air never worked as per Reuters Aero news. How is this possible? how is that MCAS can switch back and forth between good and bad sensor? The fix is to read both sensor do nothing if difference more than 5 degrees. Doesn’t fix sensor? The pilots had to turn on the power to the trim motors to undo the MCAS trim. However, due to the persistent AOA sensor offset and flawed sensor selection MCAS kept overriding the pilots aggressively. There was no time to recover either. few hundred feet altitude. Cutting out the power to MCAS motors did not fix the steep dive? What does that mean? Cutting out the power to the MCAS motors did not fix the automated trim or the steep dive? Or did fix the automated trim but not the steep dive? The latter probably? Just not enough time given the low altitude? So the pilots in desperations started trying everything. 1) software is the same in all aircrafts. How it is wired in could be different. 2) is it airline specific or vintage? Meaning when it was made. Flight control systems issue: Major upgrade in the works. Plus AOA sensor input to MCAS is not the same on all aircrafts? This is Epic systems design and implementation failure possibly? Different AOA sensor feeding into MCAS at divergent times? How is this possible? Pilot side vs first officer side. Boeing 737 Max 8 MCAS – Is the proposed Fix good enough? Swiss cheese. You hear that a lot in systems design and engineering. It is often not possible to fail safe a system with 100% certainty. Especially true when there is an unforeseen and/or unintended consequence and a fix is proposed to a problem. Root cause may not be known with certainty, however, a fix could be put in place as a short term remedy to alleviate the cascade catastrophic failure. If you stack up a few of them, then the likelihood of a through and through hole is quite low. In fact, the entire aircraft systems design is based on this principle. With several redundancies and backup and backups for backups. Engines being the most obvious example. There is computers, sensors etc that also have redundancies. Which is why the 737 Max and other Aircrafts cost $100Million. So why then was this Autonmous MCAS System basing it’s entire activation on a single sensor input? 1) If the disagreement is less than 5.5 degrees which sensor is selected? 2) is the sensor failure being addressed? How often is the disagreement over that threshold? Why was it 20 degrees for Lion Air? 3) does taking altitude into consideration help? It appears that Ethiopian Air AOA sensor offset was also 20 degrees!! What does that imply? MCAS won’t activate with 20 degree offset with the above fix. However, it doesn’t fix the root of the issue. What is causing this offset? The proposed fix simply won’t activate since variance is over 5 degrees. Could there be a deeper issue here which could be impacting other systems as well? To be continued…thoughts in progress. An Exclusive by Seattle times reporter Dominic Gates has detailed some of the lapses in the design of the Boing 737Max8 MCAS control algorithm. How Boeing and the FAA certified the suspect flight control system on the 737 MAX. It raises several questions about flaws in the design, design process and safety reviews. My hypothesis published soon after Lion Air JT610 crash is along the similar lines. I will try to answer some of the questions raised in the Seattle Times article and also in my previous blogs about this issue since we now have more information. Why was the MCAS algorithm put in place? The algorithm was required to get FAA airworthiness certification for Boeing 737Max due to possibility of high speed stall. This situation was determined to be possible by the nature of the design of the aircraft with bigger engines and different mounting locations. Possibly via CFD analysis etc. Possible. But how likely was it? 2. So what went wrong? Sensors. Angle of Attack (AOA) sensors to be precise. It appears that either one or perhaps both of the AOA sensors were compromised. The MCAS is an algorithm. It needs input from the sensors to act. If the data is flawed, it will act in unintended operating envelopes. Unless of course, it is designed to account for that. Which it wasn’t perhaps? 3. Why was the sensor data flawed? There could be several reasons for this. Let us see what is believed to have happened In the case of Air France flight 447 crash in 2009. In that case (Airbus Air France Flight 447) it was determined that the Pitot Tubes (Speed sensors) were flash frozen due to super cooled condensation in the air. This caused the aircraft to stall. To bring it out of stall, the pilots needed to pitch the nose down. However, the stall alarm algorithm had a design flaw. It would come on when nose was pitched down and turn off when nose was pitched up since in the up condition with zero speed it assumed the aircraft was on the ground. So the pilots got confused. In this case (Boing 737Max), the Lion Air FDR showed that there was an offset between the two AOA sensors. Lion Air Aircrafts do not have the optional AOA sensors mismatch light. However, the previous flights of the same aircraft had encountered similar flight control problems and it appears the maintenance crew determined that the sensor(s) were bad and replaced them. The optional light just alerts the pilot to possible issue. Doesn’t impact the operation of the MCAS algorithm. 4. So if the sensors were replaced, then how come they went bad again? Now it is possible that the new sensors were also bad. How likely is that? So possibly there is something else going on. A system issue (raised in my Lion Air Post above). 5. So how come just one bad sensor out of the two caused MCAS to trim down? That is the big question. My initial thoughts on this was that MCAS was simply selecting the worst case/input. It appears that is not the case. It is only getting only one input? If this true, then why have two sensors? My guess is that there is some pre selection of the signal via signal conditionining ASIC or ECU before feeding the input to MCAS algorithm ECU. The two ECU’s might not be the same – the signal selection and MCAS algorithm ECU. There could be several reasons for this. Would be interesting to know the ECU vintages and commonality with prior and/or other 737 models. This could be the smoking gun in my opinion. 6. Why doesn’t MCAS look at other inputs and conditions and determine validity of the sensor signal before acting on it? Good question. It should. Should have been flagged in safety reviews. Seattle Times article has good info on this. 7. What about how far it can trim and how much? The trim limits and activation thresholds should have been engineering calibrations in the algorithm. It would have made it possible to “tune it” for each aircraft variations. The FAA CANIC (Continued Airworthiness Notification to International Community) published does seem to (?) address all three issues (5,6,7). See my Ethiopian Airlines post on this. 8. So if the fixes are in the works, we should be good right? No. It isn’t just about this MCAS feature anymore. The whole design and development of this aircraft and possible all aircrafts at Boeing is suspect now. It is imperative that it be investigated properly. In the works maybe? Who is really incharge of the Boeing 737 Max investigation? Just came across this. Even Airbus Aircrafts have anti stall systems which get triggered falsely due to bad AOA sensors!! Interesting twitter conversation with Peter Lemme (interviewed for the Seattle Times article above) back in November. It is a flawed design. The feature need to be disabled. Usually such safety features can be calibrated off. Note: Will update as needed. Update: DOJ & US Department of transportation has launched an investigation into FAA’s approval of Boeing 737 Max airliner. While the FAA, NTSB, BEA, Boeing and Ethiopian Airlines are investigating the ET302 crash and how it maybe related to Lion Air JT601 crash in Indonesia. 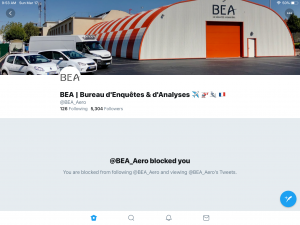 So far, we have had Ethiopian Airlines send the Black Boxes to BEA in France which seemed to imply that BEA might be leading the investigation. However, it appears that is not the case. BEA simply downloaded the data and transferred it to Ethiopian airlines. In the meantime, we have a leak from Air traffic control in Addis Ababa where a source provided information from the voice recorders to a Reuter’s reporter about the conversations with the pilots of flight ET302. Boeing 737 Max investigation compromised by data breach? So there appears to be some confusion as to who is really incharge of this investigation? What about all the physical evidence from the crash site? Where is the rest of the physical evidence (other than FDR CVR) from crash site being evaluated and analyzed? Who is leading it? Without a proper chain of command, delegation and and work protocols, the likelihood of successful investigation is very low. The Air France Flight 447 investigation was also bogged down due to these very reasons. Besides the fact that it took 2 years to find the black boxes. Someone needs to step in and say, we are incharge and publish a document that shows the working relationships and work protocol between all these agencies invloved. Boeing statement seems to imply it is NTSB. However, based on what has happened so far, that does not appear to be the case. Is that how it was handled in the case of Lion Air JT610 investigation? Via NTSB? Perhaps the US Department of Justice and Department of Transportation investigation will help clear up the confusion? Reuters aviation reporter Jamie Freed has published an exclusive based on a source involved in the Ethiopan Airlines ET302 investigation being assisted by BEA in France. How did the source know how fast the aircraft was traveling after takeoff. 460 vs 250 knots. Almost 2x! Is that even possible? Has to build up momentum on the runway. FDR data still not released by @BEA_Aero CVR data was released to @flyethiopian without listening analysis etc. Hope this doesn’t mean the data is compromised. FDR data transfered (?) soon after I sent the above response. Apparently there is a data leak in the chain of command. Not sure why BEA decided to block me on Twitter. Got misinterpreted as malicious perhaps? It wasn’t. If it were me, I would say thank-you and investigate the leak. It could be anywhere in the Chain of possession but obviously after the data extraction? Meant to say chain of possession not chain of command. Tried to point that out which is when I discovered I have been blocked. It has been pointed out that the source is air traffic control voice recordings and not from the Black boxes (CVR and FDR). So perhaps the data in the black boxes is not compromised. However, the airtraffic control data is still crucial part of the investigation and needs to be secured as well. It still isn’t clear as to who is leading the overall investigation and where? BEA appears to have simply extracted the data and sent it to Ethiopan Airlines. Very different from Air France flight 447 investigation where BEA led the entire investigation. It has happened again. Another catastrophic crash of a Boeing 737 Max 8 albeit with a different airline. The MCAS feature is like those garage door sensors. Trying to mitigate a scenario that is possible but not likely (stall). However, it has lot of false positives. Detects obstructions all the time and kicks back the garage door for no reason. Unintended consequences. Assuming that what this is. Another false trigger of stall logic triggering MCAS steep dive. New York Times is reporting that there were changes made to the control algorithm. Not sure what the reference is to. Original MCAS algorithm or some changes since the Lion Air Crash? What changes were made to the control system? Was the MCAS turned off yet? I sure hope the MCAS algorithm was turned off at the least. Hope this helps: https://t.co/dg2NsvcgL6 Will be updating it. Glad to provide assistance to your technical team. Stakes are high here for Boeing, the Airlines and passengers. Time to accelerate those fixes in the works assuming this incident is also related to MCAS algorithm. New York Times is reporting that all Chinese Airlines have stopped using the Boeing Max 8 effective immediately. Confirmation from WSJ that China is grounding all Boeing 737 Max 8. What is SouthWest Airlines in the US going to do? Can they turn off the MCAS algorithm effective immediately? Something to think about though. Given service bulletin’s were sent to all Boeing 737 Max 8 pilots with details on how to override the MCAS. Indonesia follows China and grounds Boeing 737 Max 8 fleet. More to follow? Just came across this interesting Seattle Times article. Concurs with my thesis. FAA evaluates a potential design flaw on Boeing’s 737 MAX after Lion Air crash https://t.co/tzbXQaSEzr via @seattletimes @dominicgates just came across this in the comments section of wsj article. Concurs with my thesis. ET302 Pilots should have had the bulletin though. Limiting the downward push mitigates the steep dive due to false trigger perhaps? However does it serve it purpose in case of a real stall? Those are the trade offs. Plus other unintended consequences of any design change. FAA statement and Continued Airworthiness notification to international community (CANIC). Design change is three pronged for MCAS algorithm. The activation enhancement and command limit can and should be Engineering calibrations. Signal strengthening requirement implies this is believed to be S/N deterioration issue. It appears the signal enhancement/strengthening might be requirement to use inputs from both AOA sensors in tandem and modify the algorithm to accommodate all inputs to arrive at a best best possible value for AOA instead of just assuming the worst input as true. This is my educated guess. Since I do not have any inside information. Updated statement from FAA below. Might revisit the Boeing 737 Max decision if Ethiopan Airlines flight ET302 data shows anything new. 1) Did ET302 have the AOA sensor light? Did it ever come on? 2) JT610 did not have the light. 4) what are the airlines doing differently? The Boeing 787Max issue is now linked to its MCAS algorithm which is an anti stall system!! I have been following this incident since October 2018. Reading and commenting on articles in New York Times and Wall Street Journal using Twitter thread to sort of catalog my findings. FYI @BoeingAirplanes @Boeing @FAASafetyBrief @FAANews @NTSB @NTSB_Newsroom the anti stall autonomous algorithm needs to be turned while investigation is in progress and protocol changes are being put in place. stall avoidance system created bigger problem – unintended steep dive. The Flight Data Recorder was found back in November which enabled the investigators to piece together what may have happened to this aircraft. It appears that a safety feature designed to prevent a stall condition seen in Air France flight 447 (an Airbus A330) crash created an unintended consequence of deep dive due to the perceived failure of the similar sensor as in the AF447 incident (pitot tubes) albeit a different failure mode! A functional safety failure. Boeing may have finally realized that the algorithm design might be flawed and appears to be in the process of making design changes. Finally, a software fix to prevent false AOA to trigger MACS. Will be tricky to calibrate. The cockpit voice recorder has been found now as per news reports (January 14, 2019). The WSJ article on this is reporting that there might be an issue with calibration update in the field. Field calibrations (or Service Trims as they are called sometime) can be changed in the field using service tools used by trained technicians. However, it does require a protocol, training, certification for techs etc. Usually all these are developed by engineers. There was something wrong with one of the sensor inputs here. Replacing the sensor did not fix the issue. This happened several times. So most likely it wasn’t the sensor at fault. It appears to be a 20 degree offset. Could be a mounting, wiring, signal conditioning instead of a sensor to sensor variation. Calibration fix while possible, a field technician would be not be capable of doing this. Unless of’course this was known issue, a protocol has been developed for it, it was in place, technicians were trained for it etc. 1) Why would the MCAS algorithm decide to act on flawed sensor data? Especially when there is discrepancy between the two sensor inputs. 2) Why would the MCAS algorithm automatically put the aircraft into steep dive and then ignore pilot attempts to pull the nose up? 3) Why does it require the pilot to turn off the feature by manually disabling the control system? Also, questions have been raised about pilot training and training manuals. How do you write a training manual for a flawed design which may not be an intended feature? You can’t. Which explains why there wasn’t a training protocol for this. I hear Boeing is making design changes to the MCAS algorithm which once released would require a software update to the ECU in question. Needless to say before making any such changes a comprehensive functional safety review of the entire system is warranted using methodologies like Failure Modes Effects and Diagnostic Analysis. It is time to regulate the autonomous vehicle and autonomous ride share services space. Similar to the regulations we have in the healthcare space via FDA. Perhaps even more critical here since the repercussions are lot more severe. In the medical field, the failure of a product or service only impact the patients receiving that product or service (NCDs). Here, an autonomous vehicle has the potential to cause havoc way beyond just the person(s) receiving the service at the time of service delivery. What business do non automotive manufacturers have selling an autonomous vehicle or a service? They are basically modifying a vehicle with their own technology and are selling a service using a product that has been tampered with. Automotive manufacturers have decades of experience in bringing fail safe systems to market. The app makers don’t. It is simply impossible to develop fault tolerant mission critical systems in overnight hackathons. It is a iterative process. Takes time to evolve. So for starters, why not mandate that technology providers have to work with OEMs and only an OEM can sell an autonomous vehicle. A service provider can buy the certified vehicle from the OEM to sell a service. This way the OEM is responsible;y for the system, and there is no finger pointing when there is an incident. This will make the entire autonomous ecosystem a lot safer. The autonomous ecosystem includes smart infrastructure as well. This needs to be developed in parallel. Obviously the tech providers have to work with the public sector on developing the smart infrastructure. 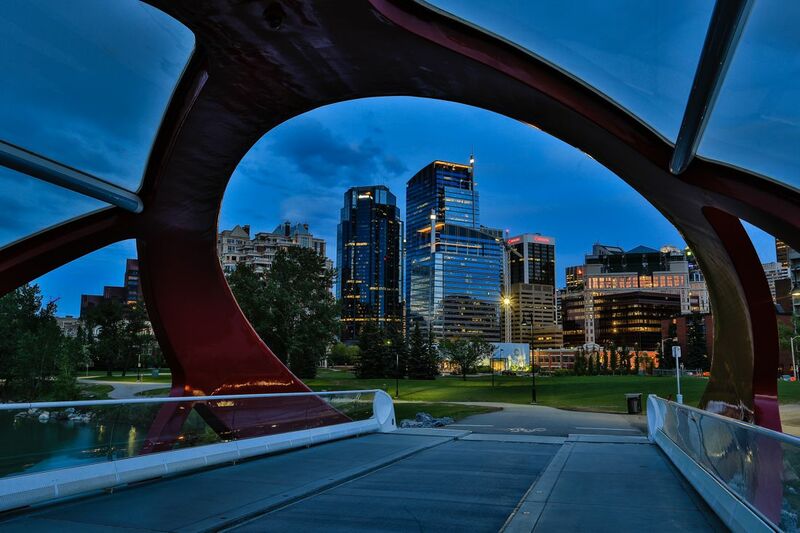 The autonomous vehicles will be crucial part of the autonomous smart infrastructure. It is imperative that its evolution be managed in controlled manner by working with the OEMs similar to what we do with infrastructure via the public sector. The only way it will happen is via regulation. Need someone in US Congress (House or Senate) to sponsor the bill. We know it won’t be anyone from California for sure. 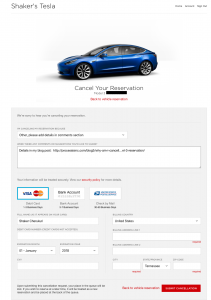 Why am I cancelling my Tesla Model 3 Reservation? I ordered my Tesla Model 3 on December 27, 2017 after all the initial order rush was over. The email said Delivery estimate was mid 2018. I didn’t believe it and was prepared to wait until 2020 to get my $35,000 Tesla Model 3 with the additional $7,000 tax credit which would bring my effective cost down to $31K with the sales tax factored in ($38K – $7k). Would be cash purchase so no financing cost etc. Don’t believe in borrowing money to buy a depreciating property – A topic for another conversation perhaps. Then few months into 2018 I got another email saying the new estimate was late 2018. Really? Didn’t believe it. Still waiting for 2020. Then came the great reviews of the product from early adopters and some consultants which added to the anticipation. Then the horror stories about bottlenecks, delay’s, quality problems, scrap rate etc. All understandable and to be expected since since we have a new product, new process, new supply chain, new robots, new software etc. However, the car runs on Linux. Not acceptable to me as an embedded systems engineer in my early career. This is the reason I waited to order a Tesla since my expectation is that by 2020, Tesla will run on new Nvidia GPU that runs on QNX. That and the fact that new products, especially cars, take years to mature to a point where the defect rate stabilizes to a manageable level. The 2020 Tesla’s shouldn’t have the durability issues that the 2013 Tesla’s are having now. Key word being shouldn’t. However, it appears there is a huge culture issue at Tesla that permeates the entire organization driven my Mr. Elon Musk’s management style or lack thereof. This will prevent Tesla from addressing the product issues and slowly improving the reliability (infant mortality) and long term durability issues. Now that is a deal breaker for me. It doesn’t help that the $7,000 tax credit will expire soon as well, however, that was not a deal breaker. Can this be fixed? Maybe. But not by 2020. Also, by then there will be other choices in this space from competitors that are laser focused on making the cars instead of being distracted by flamethrowers, short shorts, submarines, rockets etc. Now this (hobbies) would be ok if there was trust and empowerment to senior managers that manage supply chain issues, operations etc. There isn’t. Making reliable and durable cars profitably is lot harder than it appears….